Today I got my parcel from oasap.com and I'm so happy with these shorts and the dress that I ordered. You can get these amazing shorts here. You can combine them with everything I guess, also white is the best summer color, and lace is a hot trend for summer! I chose a denim shirt- totally love it - and my Zara wedges. Do you like this look ? Thank you for your amazing comments dear! Please come and check out my blog! Also, I have a great giveaway going on right now! It's only two simple steps to enter. Please enter and then share the post on your blog and facebook! Denim and lace always looks so good together! Love those shorts! poli omorfo to outfit..ta paputsia kai to sortsaki einai teleia!! Liking the shorts a lot!!! So pretty! Ive been wanting lace shorts for so long now but for some reason i never got around to owning one. Oasap is the best and ur rocking those pair! PS. Please join my shamballa bracelets giveaway! wow! 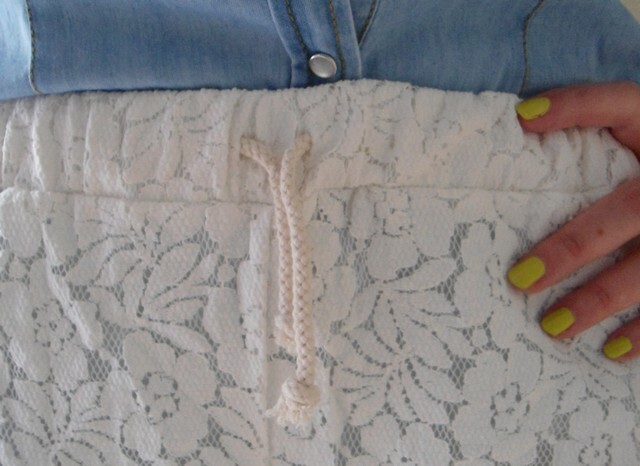 I love to wear lace shorts with denim shirt as well! Your lovely!!! I love lace with denim-it looks great! love your lace shorts dear!! So sweet! Great outfit, but in Brazil it's cold now! Those lace shorts look great on you! Fantastic outfit, I love everything! I have been actively searching for lace shorts for a while now. I love the way they look! your lace shorts are too cute!! I definitely love this look! Exquisite shorts hun, and beautiful shoes! Lovely, those wedges are amazing! As well as the shorts! Eida oi platformes Zara einai fantastikes! Ama thes perna mia bolta apo to blog mou!Exw kai giveaway ayto to kairo! Those shorts are to die for, so pretty! Lovely shoes as well! Cute shorts! I have some lace shorts from Oasap as well! adorable shorts and i love the color of your nails. Le short est canon!!! J'adoore! those shorts look fabulous on you!!! yay! really hope that my order will arrive soon! Like I said, I love your shorts! I'm looking forward for your new post, thanks for your comments! This Outfit is really awesome! I fall in love with your shorts and your denim blouse and the shoes go really perfectly with it!! Gorgeous jewellery!! Thumbs up!